Prada Sunglasses first surfaced on Chictopia's streetstyle gallery in Winter 2010 seen on Paris blogger Denni of Chicmuse.com. She wore her Prada sunglasses with a H&M shorts, Sergio Rossi shoes, and Zara shirt. Since then, Prada Sunglasses have grown in popularity as bloggers from Los Angeles, THESSALONIKI, and Atlanta have discovered them. Prada Sunglasses are generally seen in chic, casual, and trendy style. Popular types of Prada Sunglasses are baroque round, tortoise, minimal baroque, cat eye, and baroque. Blogger's favorite colors are black, dark brown, brown, and blue. There are currently 1007 streetstyle photos of bloggers wearing Prada Sunglasses. 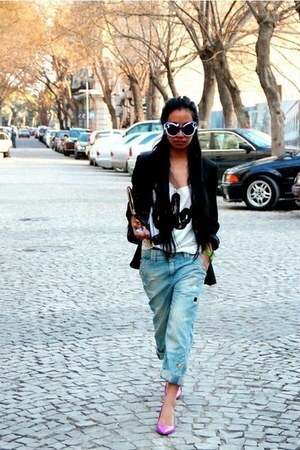 Most recently, blogger Kryz of kryzuy.com styled her black Prada sunglasses in a streetstyle look.